Researchers analyzed data from the Early Childhood Longitudinal Survey, which follows more than 10,000 children who were born in 2001. For this study, Dr. Mark DeBoer and his colleagues used information from 9,600 children who were examined at 2 years, 4 years and 5 years old. The children's parents were asked about their kids' beverage intake, the family's race/ethnicity and socioeconomic status, and the children's television or video viewing habits, among other things. The children's height and weight were also recorded at each examination. Kids who drank one or more sugar-sweetened beverage per day were categorized as regular "SSB" drinkers. The term "sugar-sweetened beverage" included soda, sports drinks and fruit drinks that were not 100% fruit juice. Overall, the researchers found relatively few young children who drank sugar-sweetened beverages. About 9% of 2-year-olds, 13% of 4-year-olds and 11% of 5-year-olds were regular drinkers. They found more consumption among non-Hispanic black and Hispanic children and in families with a lower socioeconomic status. Researchers did not find a link between sugar-sweetened beverage consumption and obesity when the kids were 2 years old. But they saw a different result in their 4- and 5-year-old study participants. Regular SSB drinkers at this age were more likely to be overweight or obese than infrequent drinkers. The study authors also found that children who drank more than one sugar-sweetened beverage daily at age 2 had a greater increase in BMI by age 4. The weight results may be linked to other discoveries the researchers made. Children who were regular SSB consumers were more likely to have a mother who was overweight or obese. They were also more likely to watch more than two hours of television a day. On a side note, the researchers also found that kids who drank sugar-sweetened beverages regularly were less prone to drinking milk, which could "underscore additional nutritional problems," the study authors wrote. 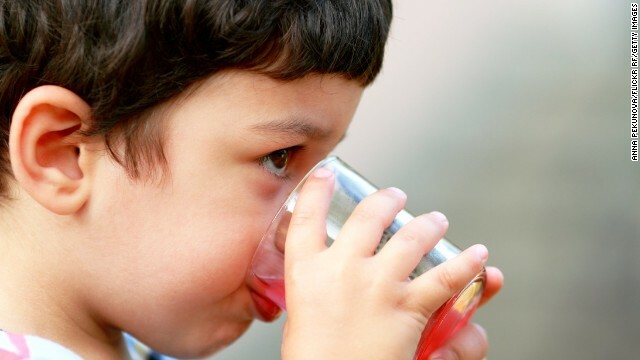 The data collected in the Early Childhood Longitudinal Survey are based on parents' answers to questions, so kids could have consumed more (or fewer) sugar-sweetened beverages than parents reported. The study authors did also not have access to information about the children's overall calorie intake or physical activity, which may have played a role in their weight. This study "further raises the need for pediatricians and care providers to strongly discourage SSB consumption in early childhood," the authors wrote. "Additionally, from a public health standpoint, strong consideration should be made toward policy changes leading to decreases in SSB consumption in children." In a complementary editorial, also published in Pediatrics, Dr. Anisha Patel and Lorrene Ritchie say that "to date, most SSB policy discussion has neglected the youngest children." They note that beverage policies have been implemented in many workplaces and a majority of school districts but haven't been introduced in community settings such as day care or park systems. • Establishing healthy vending standards for parks. • Making milk or water the default for restaurant kids' meals. • Providing training for child care providers. • Promoting water in the government's My Plate materials. • Prohibiting marketing of sugar-sweetened beverages to children. All in moderation. Some just can't figure that out. No way! Sugar causes higher weight and other issues! I had no idea! smh..... duh! Sure..if they drink gallons of it everday. Juice, while it appears healthy, can be just as bad as soda - a typical glass of OJ contains all the sugar of around six oranges, and hardly any of the fiber. If I juice things at home, I mostly juice veggies, and add in maybe a little fruit (ONE orange) for flavor. This is the dumbest article. I had to click into to make sure the people in the comments weren't actually surprised. Way to go, America! Thanks for not showing me you're not as dumb as the researchers. This message cannot be said loud enough and enough times. It's not just soda and juice sometimes the sports drinks are the worst, most certainly the way they are marketed (Drink enough of this and you too will become an athlete!) -often kids drink these sugary sports drinks as much if not more than soda because they think they'll help them become athletic. Trust me, I've worked with obese children at Louie's Kids for 12 years -they'll tell you they drink no soda or juice but lots of gatorade. This is why we produced a PSA on our site (with one of our real kids) called #breakingupwithgatorade check it out on our homepage. Parents who frequently stock soda and sugared drinks and even artificially sweetened ones to serve to their families need serious counseling. There's little to know benefit to drinking sugar or ingesting chemicals. Doctors and insurance companies could help here though by requiring nutritional counseling to new parents. This is no different than discounts for defensive driving courses or companies waving health insurance premiums for workers who under-take a health assessment. We know as a over-weight individuals and those that ingest chemicals have higher rates of disease. We nee to set the right incentives. My children have soda and juice and are not over weigh so your comments are false. Wow! Consuming sugar has some sort of nebulous connection to weight gain. Genius! Wow really!! Gosh you truly are a genius!! You must be the same person that stated eating fast-food will make you fat!! You flipping moron. The government and the anercian population know this but yet on a daily basics food companies, lawyers and lobbyist change and alter words and labeling of foods to trick you!! Wake up and just eat fresh food and exercise it's that simple!! So what they are trying to say is if I were to eat a bunch of sugar with no exercise then I would gain weight? Reblogged this on What Would John Mack Eat?. I thought that the article explained how kids can become obesity by drinking sugar-sweented beverages. I have to say that the most confusing part of this article is that, I don't understand why it is a bad thing to drink sugar-sweetend drink. I think this because all kids would rather drink those types of drinks than water and or milk everyday. This made me feel very undecided. I felt undecided because of the fact that it is saying children should drink milk and or water instead of sugar-sweetend drinks. What if the child do not like or may be allergic to milk? For a result, I think that they should give the children who are obesity some diet choices to help and better their health. I thimk that kids that drink juice should drink more water than juice. They should limit the amount juice that they drink like 2-3 cups a week to prevent diabetes. Juice may taste good but its a very bad choice for kids , cause they may get obese or get diabetes. to prevent this change juice with water or milk. The article was about children that drink juice and soda rather then water and milk. I think that children should be aloud to have 1 or 2 juices per week, i dont drink soda very often and i only drink juice in the morning. Also, i believe that if a child is going to drink soda or juice they should be on a diet. I dont particularly think that juice is too bad but soda is a no. Children shouldnt drink as much as adults do. This article was not surprising. I think that children who drink soda and sugar-sweetened beverages rather than water and milk under 8-10 years of age as regularly as these children did, is ridiculous. Children that young should be drinking fruit juices without lots of sugar, water and some regular milk (not the sweetened flavors kind, like strawberry or chocolate). Drinking sweetened fruit juices is understandable, but these children of this young of an age, should not be drinking things that have been deemed bad for even adults, who weigh at least twice their weight. I just read another article on Natural Standard about the harmful effects from fruit juice, linked to increase diabetes risk and obesity. Juice not being as healthy as you think is an important teaching point for healthcare professionals to make to patients. I am trying to find out good quality blogs for reading. I used to be searching over the search engines and located your blog. Effectively i really like your expert weblog layout as well as your posting abilities. Carry on doing it. great delivery topic excellent blog post i couldn’t refrain from commenting where can i find out more?